With one 27-2 run that lasted less than ten minutes, North Carolina State emphatically answered the question, “How can this basketball season get worse for Syracuse?” One day after the NCAA blasted the Orange basketball program with one of the strongest penalties in intercollegiate athletics history, the Wolfpack routed SU, 71-57, in the regular season finale between the two teams. 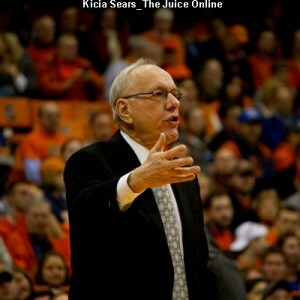 It has already been reported that head coach Jim Boeheim will appeal the judgment against him and the university is contemplating an appeal, as well. 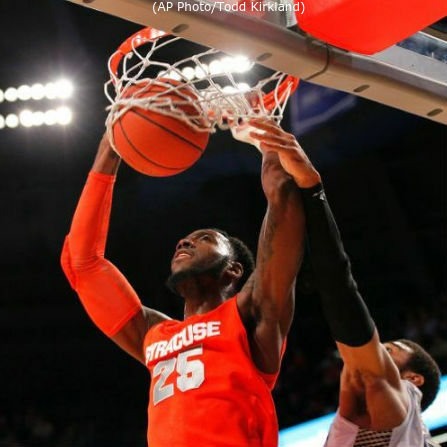 The loss dropped Syracuse, who had already announced a self-imposed postseason ban last month in reaction to their NCAA investigation nearing a close, to 18-13 on the season and 9-9 in ACC play. The Wolfpack hopped the Orange in the conference table with the win, finishing their schedule at 10-8 in the ACC and 19-12 overall. For the ninth time on the season and third game in a row, SU shot under 40 percent from the floor. On this occasion, Syracuse made only 32.3 percent of their shots from the field, their second-worst on the season, including a paltry 25.9 percent of their tries in the opening half. In contrast, NC State made 41.3 percent of their shots in the game, including 45.9 percent in the second half, when they outscored the Orange by 13 points. Both teams started the game slowly on offense, but Kaleb Joseph banged in a three-pointer with less than four minutes elapsed to give SU a 7-5 lead. NC State would tie the score, but Michael Gbinije would drop in a pull-up jumper from the left wing and Rakeem Christmas added a pair of free throws for a four-point Syracuse advantage. That Gbinije jump shot, however, would be the last Orange field goal for over seven minutes. Fortunately for SU, their defense kept them in the game, as did making all six of their fouls shots they attempted during the drought. In fact, when Gbinije ended the cold snap of seven straight misses with a three-pointer off the right wing, his shot broke a tie and gave Syracuse an 18-15 lead. The Orange defense continued to play well and, after Christmas scored off a nice drop step and Cooney curled off a screen to hit a three, SU held a 23-15 lead and forced the Wolfpack to call time out with under 4:30 to play in the half. After each team scored a basket, NC State finished the half strong, closing out the session with nine straight points for a 26-25 lead at the break. That run, coincidentally, was the start of the 27-2 rampage that effectively ended the contest. The ‘Pack scored the first seven points after halftime to push their lead to eight. After Christmas scored to snap that burst, NC State piled on 11 more points, making what was once an eight-point Syracuse lead into a 44-27 Wolfpack stranglehold just over five minutes out of the break. Gbinije hit another three to snap the run and Tyler Roberson scored in transition to draw SU within a dozen points, but NC State kept them at arm’s length for a couple minutes until ripping off a quick seven straight points to push their lead to 55-37 and force an Orange time out just past the midpoint of the half. 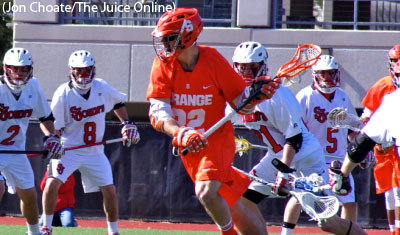 Syracuse scored the game’s next nine points, led by Roberson. The sophomore forward got a couple transition dunks to start the run, the latter being an alley-oop from Gbinije, and another deuce when Gbinije found him open under the bucket and zipped him a pass from the top of the key for a lay-in. When a Ron Patterson foul shot ended the run, the Orange trailed, 55-46, with just over five minutes to play. The two squads traded scores, then the Wolfpack pulled away, using a 9-0 run to double their lead and go up by a 66-48 margin with 2:30 to go. From that point, the benches provided the lone highlights. First, a former walk-on of the Wolfpack splashed a three to push the margin to 20 points and later, after Jim Boeheim emptied his bench, graduate student Carter Sanderson, who transferred from Lipscomb to use his final season of eligibility, scored his first points in an SU uniform when he drilled a trey for the final points of the game. Tyler Roberson was the leading scorer on the day for Syracuse, posting his sixth double-double of the season by finishing with 16 points, including ten in the second half, and a dozen rebounds. While suffering through a 5-for-16 shooting effort in his final game for SU, Rakeem Christmas still finished with a strong 15-point, 12-rebound, five-block stat line. Michael Gbinije added ten points while Trevor Cooney chipped in with eight. Jacob Lacey and Ralston Turner each took home game-high honors, scoring 19 points for the Wolfpack. Lacey buried three triples while Turner knocked down five shots from behind the arc. Anthony Barber was the third NC State player in double figures, finishing with ten points.